Washington, DC plastic surgeon Mark Richards, MD explains how the first Viora Reaction™ in the area utilizes radiofrequency energy to provide patients with a non-surgical cellulite reduction, body contouring, and skin tightening option. 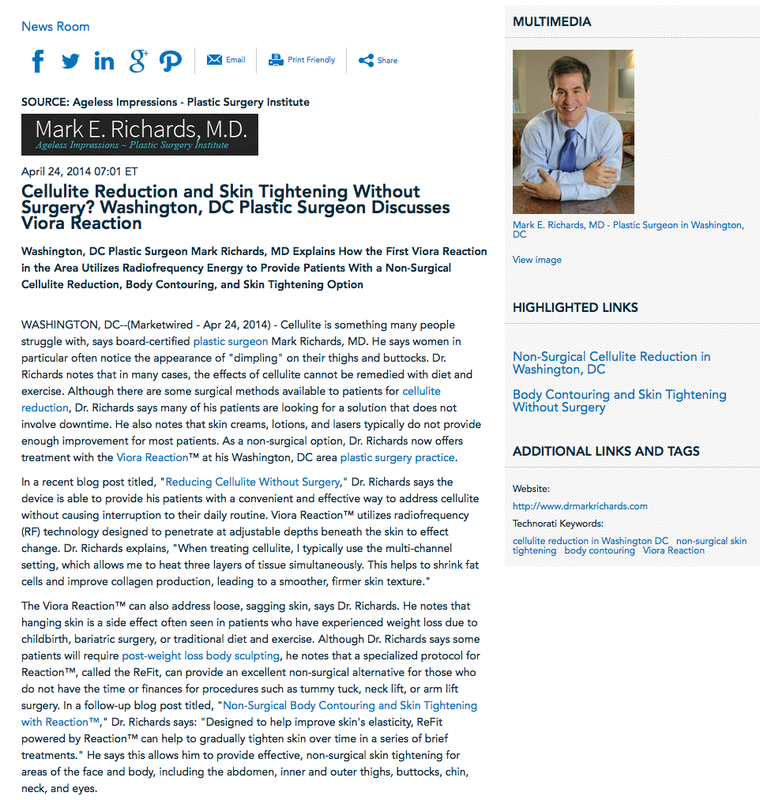 Washington, DC — Cellulite is something many people struggle with, says board-certified plastic surgeon Mark Richards, MD. He says women in particular often notice the appearance of “dimpling” on their thighs and buttocks. Dr. Richards notes that in many cases, the effects of cellulite cannot be remedied with diet and exercise. Although there are some surgical methods available to patients for cellulite reduction, Dr. Richards says many of his patients are looking for a solution that does not involve downtime. He also notes that skin creams, lotions, and lasers typically do not provide enough improvement for most patients. As a non-surgical option, Dr. Richards now offers treatment with the Viora Reaction™ at his Washington, DC area plastic surgery practice. The Viora Reaction™ can also address loose, sagging skin, says Dr. Richards. He notes that hanging skin is a side effect often seen in patients who have experienced weight loss due to childbirth, bariatric surgery, or traditional diet and exercise. Although Dr. Richards says some patients will require post-weight loss body sculpting, he notes that a specialized protocol for Reaction™, called the ReFit, can provide an excellent non-surgical alternative for those who do not have the time or finances for procedures such as tummy tuck, neck lift, or arm lift surgery. In a follow-up blog post titled, “Non-Surgical Body Contouring and Skin Tightening with Reaction™,” Dr. Richards says: “Designed to help improve skin’s elasticity, ReFit powered by Reaction™ can help to gradually tighten skin over time in a series of brief treatments.” He says this allows him to provide effective, non-surgical skin tightening for areas of the face and body, including the abdomen, inner and outer thighs, buttocks, chin, neck, and eyes. Ultimately, Dr. Richards says the Viora Reaction™ will help many patients improve the appearance of their skin without the need for surgery or recovery time. However, he cautions potential patients that Reaction™ may not be the best solution in all cases, so it is important to have a consultation prior to treatment to see if this procedure is the most suitable option. Yale graduate Dr. Richards earned his medical degree from the University of Maryland School of Medicine. Since 1999, he has consistently been selected by national boards and publications as one of the best plastic surgeons in the country. Dr. Richards is board-certified by the American Board of Plastic Surgery, and he is a member of the American Society of Plastic Surgeons. Dr. Richards is available for interview upon request. To learn more about Dr. Mark Richards and his practice, please visit drmarkrichards.com.